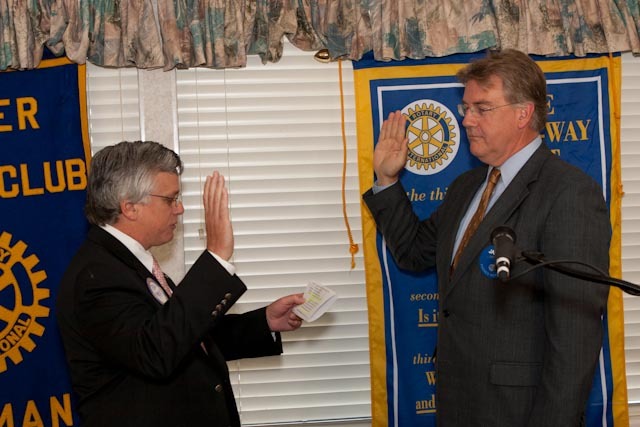 Norman banker James Harp was installed as president of the Sooner Rotary Club at its regular meeting Tuesday morning. Rotary District 5770 Gov. Phil Moss administered the oath of office to Harp and to the other officers and directors. Incoming officers are: out-going president Denise Kueny, vice president; Linda Holt, secretary, and Bill Osborn, treasurer; Lucinda Francis, president-elect, and Kevin Murphree, president-elect nominee. Directors and the committees they will chair are Kevin Murphree, Community Service; Bobby Hare, Fellowship, Rodney Young, Fundraising Co-Chairs; Joan Barker International Service; Tracy Curtis, New Generations; Lucinda Francis, Membership; Sean Braddy, Nexus; Chad Vice Programs; Conni Eckstein, Public Relations; Amy Bass, Vocational Service; Christie Moore, Ways and Means, and Wade Stewart, sergeant at arms. Harp named Judy Simpkins to chair Festival 25, the celebration of the 25th anniversary of the founding of Sooner Rotary, and Jen Tregarthen will chair a committee on the flag and brand design. Joan Abbott, president of the Professional Educators of Norman.